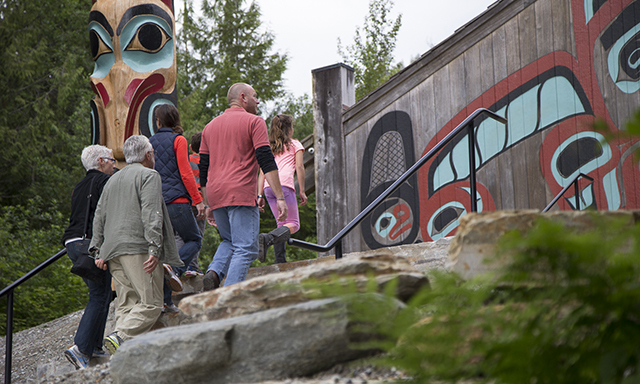 Immerse yourself into the living culture of modern-day southeast Alaskan Natives and view Saxman Totem Park, which boasts the world's largest collection of authentic totem poles. Experience the time-honored Tlingit tradition to greet guests with elaborate ceremonies. Feel the warmth and charm of the tour's hosts, who unlock the past and the mysteries of the totems. Visit the Beaver Clan House for a private performance of heart-pounding Native dances and heartfelt tribal stories. • Saxman Totem Park: Learn the secrets behind the world's largest collection of authentic totem poles. • Cultural Immersion: Learn from tour hosts who share their Native history, art and ancestors' way of life. • Beaver Clan House: Hear tribal stories, watch an exclusive Native dance performance and partake in the final dance. • Please note that although the village is modern, it still upholds Native traditions and culture.